Established in 1936, GSC Schwörer manufactures demanding products combining superior quality and individuality for customers in a variety of industries. 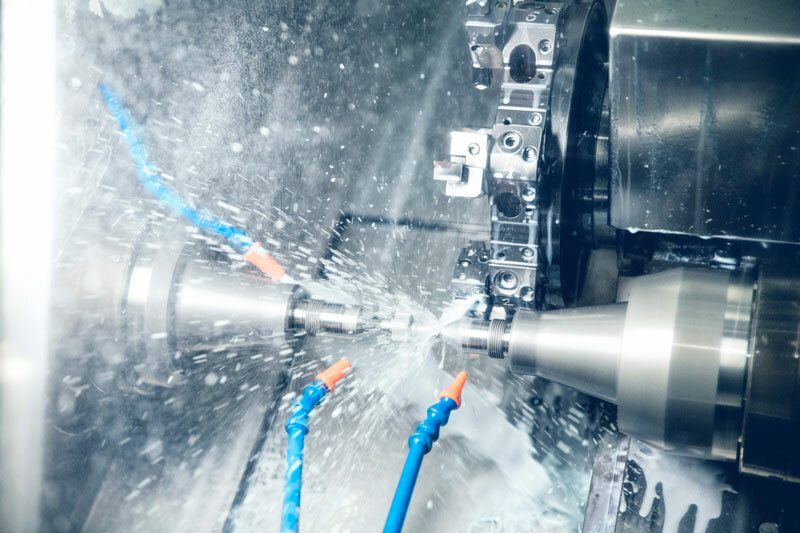 In addition to building gear parts, GSC Schwörer specialises in the development and design of customised gears and geared motors in many different shapes and sizes. Meanwhile in the hands of the third generation, this family firm still has its headquarters in Eisenbach in the heart of the Black Forest, a region with a strong tradition of innovation. 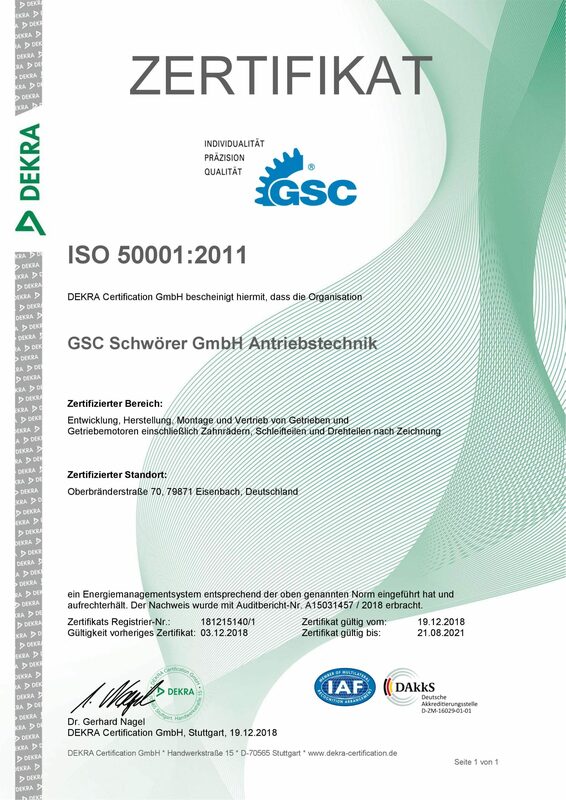 Our energy management system was successfully certified by DEKRA in accordance with the latest version of the ISO 50001: 2011 standard, at the turn of the year. The energy management according to ISO 50001:2011 includes the development of systems and processes required to improve energy performance, including energy efficiency, energy use and energy consumption. With the systematic implementation of the energy management system, we assume ecological responsibility and protect our valuable resources. The certificate is available in the download section of our website. Fast-paced and highly dynamic markets require ever shorter innovation cycles in which the players must deliver cost-efficient, quality-optimised products. The experience and know-how we have acquired and developed throughout many years in the business help us – and you – to think outside the box, as the starting point for a future-proof drive solution that is precisely tailored to your needs and those of your industry. In pursuit of the guiding principles – individuality, precision and quality – GSC Schwörer has progressed from a small business to an innovative and efficient mid-market producer of drive technology. 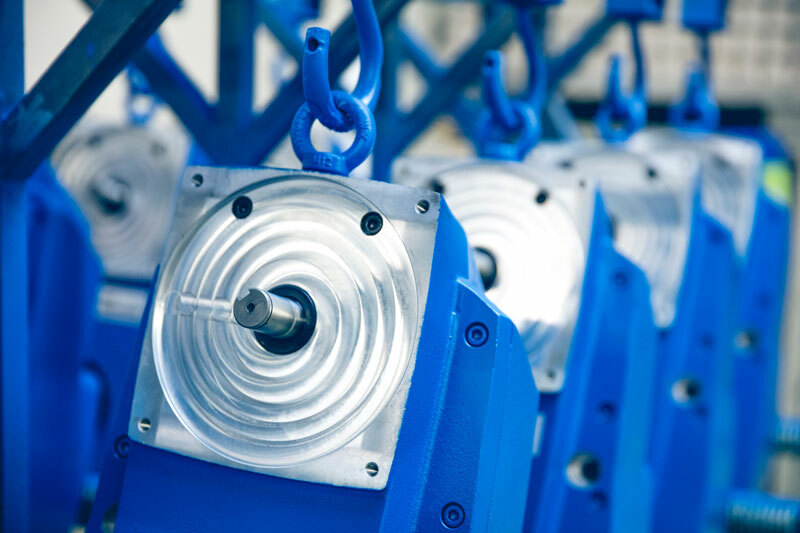 We develop gears and geared motors that are tailored to the individual needs of our customers. 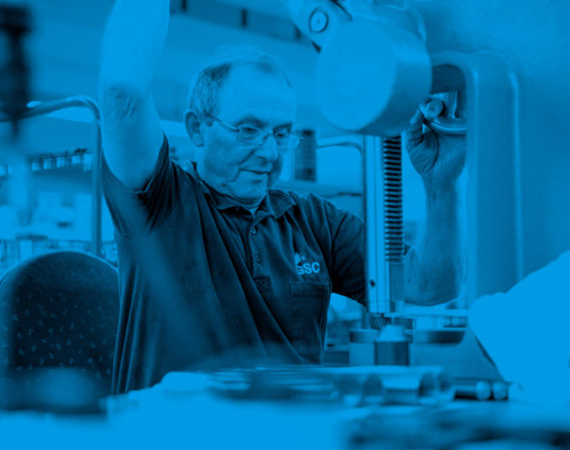 Our high technical standard and sound manufacturing expertise, coupled with the passionate commitment of more than 110 qualified staff, are your assurance of consistently high precision and product quality. Back in the late thirties, when a small Black Forest firm set out to make components for the region’s thriving clockmaking industry, no-one ever dreamed that this unknown supplier would one day become one of the most innovative and most competent manufacturers of high-performance drives. “Gebr. Schwörer und Co. Apparatebau und Feinmechanik” was founded in 1936 by brothers Oskar and Edwin Schwörer and their brother-in- law Josef Grieshaber in Eisenbach in the heart of the Black Forest. 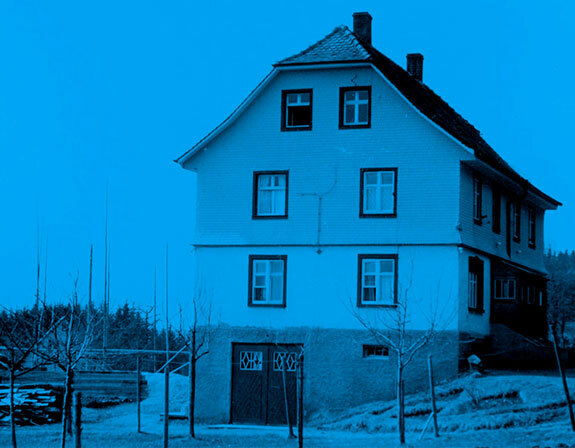 They started off manufacturing precision components for the booming Black Forest clockmaking industry – for a while at the family home and from 1942 at the present site. Their precision engineered parts were mainly used in cuckoo clocks. After the war was over, the company initially made tobacco shredders, storm lighters and pasta machines. From 1946, the Schwörer family also manufactured timers for hair dryers and electric ovens. In 1968, the company was taken over by cousins Wilfried and Egon Schwörer. The transition to the next generation coincided with the launch of new product lines. In addition to manufacturing speedo drives for two-wheelers, the company also began making customised parts which were built to spec for the automotive industry. The eighties marked the entry into the systematic development, design and manufacture of gear parts and customised drive solutions. The emphasis was on developing and producing planetary gears tailored to individual customer requirements, for example in materials handling, textile machinery and building services. In 1986, the production floor space was increased with a new building to 4,250 square metres and the pool of machinery expanded. In December 1988, the company changed its name to GSC Schwörer GmbH. At the beginning of the nineties, Egon Schwörer retired. The rapid growth during his later years in charge and the limited opportunities for further expansion in the Black Forest led Wilfried Schwörer to open a metalworking subsidiary – B&S Metallbe- und – verarbeitungs GmbH – in Zwönitz (Saxony) in 1993. 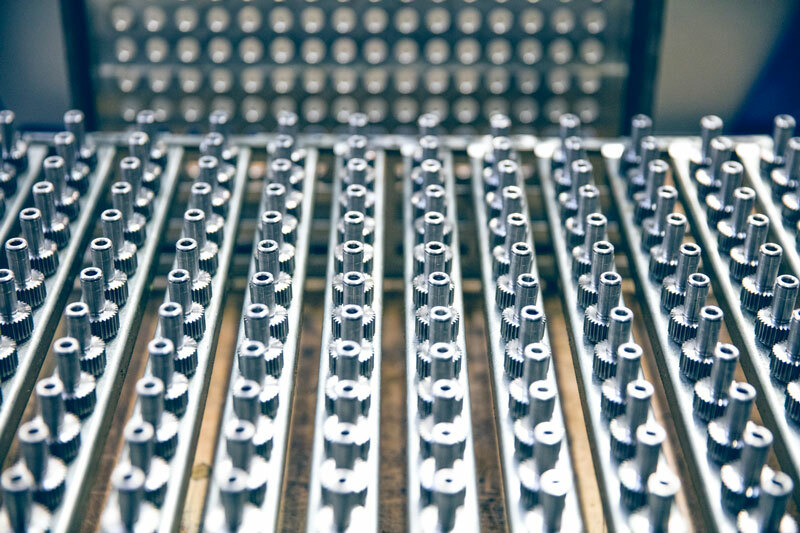 Today, the company employs 110 highly qualified staff who manufacture precision machined parts on 5,300 square metres of floor space using modern, efficient technology. Dr Martin Schwörer’s entry into the company in 2001 ensured its continued existence as a family-owned firm. Tina Schwörer, Wilfried Schwörer’s daughter, joined him in 2006 as Managing Partner. After running the business for 43 years, Wilfried Schwörer withdrew from operational management in 2012. Since taking over at the helm, Tina Schwörer and Dr Martin Schwörer have been committed to moving the company forward continuously – and to maintaining our innovative vitality as we strive to design and implement customised drive solutions better than anyone else in the market. Join our Team and Help Drive our Future Success! Qualified and dedicated staff are the cornerstone of our traditional family firm’s success. Developing these employees – and recruiting new, capable people who share our values – is an ongoing objective. Why not become a part of our team and let your know-how, your skills and your ideas drive our company’s future?